Like it or not, mythological weapons are always an exciting topic, since they have to do with exciting stories of invasions, wars, crime, and riots. They also go to show how the human imagination managed to cook up some fascinating tools, ever since ancient times. The very first weapons in history might have been used five million years ago, in prehistoric times. Also, in ancient times, weapons suffered revolutionary improvements, in terms of materials and crafting techniques, which were the very first stages in military technology. But, perhaps most importantly, tales of weaponry rouse our imagination because they make us think of mythology, lore, tradition, and tales. Today’s ten mythological weapons may or may not have been used by the ancient gods, but we guarantee they are worth your attention. 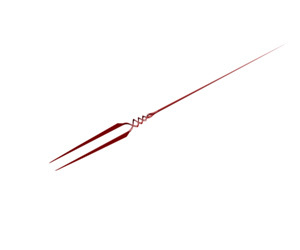 Also known as The Holy Lance or The Spear of Destiny, The Spear of Longinus is the same spear the Roman soldier Longinus used to pierce Jesus when he was crucified. From the wound flowed water and then blood. The Romans wanted to break Jesus’ legs, but then realized he was already dead. However, to make sure this was the case, the Roman centurion Longinus pierced him with the spear. In 570 the spear was in the basilica of Mount Zion and in 615 it was captured by the Persian king Khosroes II. The iron tip of the spear was given in the same year to Nicetas, who took it to Constantinople and deposited in the St. Sophia cathedral. King Louis IX of France obtained the spear in 1244 from the Latin Emperor of Constantinople and kept it in Sainte Chapelle, Paris. During the French Revolution, the relic was moved in the National Library and later disappeared. 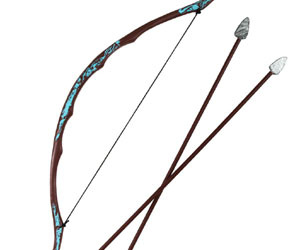 In Homer’s poems, Apollo is often called “the one who sent the arrow far”, with reference to his bow and arrows, which commonly accompanied him. His bow had the power to spread plague and pestilence, like the one that erupted in the Greek camp during the siege of Troy. As a punishing god, Apollo often sent his arrows into the world, which were assigned with sudden deaths. In ancient Greece, this was considered by far one of the most feared of the mythological weapons of the ancient gods. Nowadays, we are familiar with Thor’s Hammer, mostly thanks to an Internet meme – Techno Viking. But when it comes to mythological weapons of the ancient gods, it’s important to note that the old German god of thunder actually had one of the most terrible weapons. 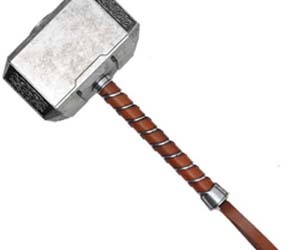 The hammer of Thor had the ability to magically returns to its master after being thrown. It also has the power to unleash thunder. In order to wear it, Thor donned a belt that increases the hammer’s powers, as well as special gloves. With this hammer Thor fought giants. Modi and Magni, the god’s children, will inherit the hammer and live on even after Ragnarok, the catastrophe that will destroy everything, when the earth will sink into the sea. The Narayanastra is Vishnu’s own weapon, which has the power to launch millions of deadly missiles simultaneously. From the descriptions, its power is a million times greater than nuclear weapons. 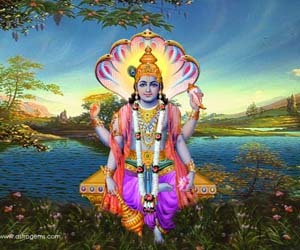 The only defense is total submission of the victim in front of Vishnu before the missiles launch. During a war, this weapon can only be used once, but if used twice, it will simply devour the army of whoever released it. 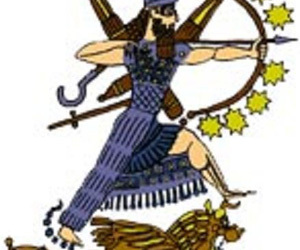 Roughly translated as “smasher of thousands”, the Sharur is both the weapon and the symbol of the solar Sumerian god Ninurta. This enchanted talking object provides the god with intelligence in battle – kind of like a voice command function on today’s smartphones. Its presence was of the utmost importance in the battle of Ninurta against Asag, a monstrous demon. Sharur can fly across great distances without being stopped and communicates with its wielder. Excalibur is the legendary sword of King Arthur, which has some magical attributes, but its main characteristic is that it shows the person with the right to rule Britain. Legends say that Arthur raised the sword which was stuck in a stone and therefore obtained the throne. 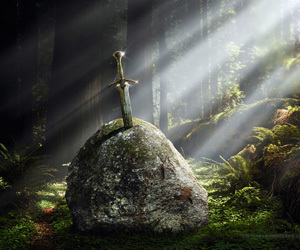 Only the real king has the power to remove this stone which was forged in Avalon. When Arthur raised Excalibur, the legend says it was so bright that the enemies of the king were simply blinded. The sword also has some powers of its own: the person who uses it cannot die due to a hemorrhage as a result of wounds received in battle. In Welsh, Excalibur is known as Caledfwlch. The great God Poseidon always wore his Trident, one of the most remarkable and famous mythological weapons of the ancient gods. 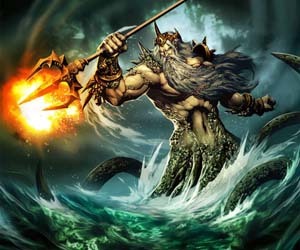 At one point, Poseidon used the trident to create horses in water. Other ancient gods also used the trident: Neptune in Roman culture and the Hindu god Shiva, who yielded the Darshana. 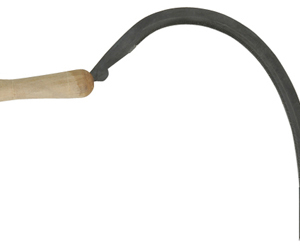 Some gladiators used this weapon in battle as well. Meanwhile, the symbol became a trademark on the state flag of Barbados. And of course, it also shines on luxury Maserati cars. Asi is a legendary sword mentioned in the epic Mahabharata, the first sword created by Brahma. Its origin lies in sacrifice. 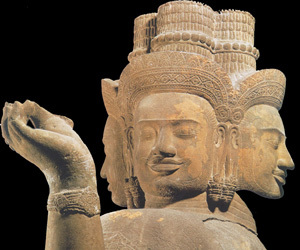 Brahma, the creator of the Universe, was approached by some gods who protested against the evil doings of demons. Searching for reconciliation, Brahma decided to make a sacrifice, during which a dreadful creature with terrible teeth sprang from the fire as the earth started shaking. Brahma called the being Asi and the creature took the form of a glowing, sharp-edged sword. He gave the blade to Rudra and asked him to punish the sinful and restore righteousness. Legendary king of Titans and God of the Harvest, Cronus, is most often depicted with a sickle, the weapon made by mother Gaia in order for him to fight his father, Uranus. Using this weapon, Cronus castrated his father and succeeded in overthrowing him as ruler of the world. Ironically, the same sickle will be used by the sons of Cronus to kill and cut him into a thousand pieces before throwing him in the underworld. Also, the sickle is a reminder of Cronus’ orgins: he was first an agrarian deity before his myths got more and more complex. The Roman correspondent of Cronus, Saturn, is represented with the sickle in one hand and a bundle of wheat in the other, adding to the connection with harvest. The last on our list of mythological weapons of the ancient gods is a legendary weapon created by Guan Yu in the historical novel R”. 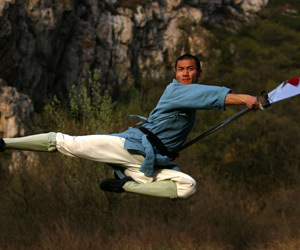 It is actually a guandao, a type of traditional Chinese weapon. It is said that sometimes during battles which took place on snow, there would be constant blood on the blade, which froze, creating a nice layer. Legend has it the blade was being created by a blacksmith, when a green dragon passed. The dragon was killed and cut and parts of his body were integrated into the blade, giving magical powers. We hope you enjoyed our list of the ten most awesome mythological weapons used by the ancient gods. Don’t forget to let us know in the comments if we’ve left out any of your personal favorites – and also let us know if there’s any weapon you’re particularly fond of, or would use in a battle for your own life. Chronos is an Ancient Greek primordial deity of time. Cronos is the God of the Harvest, King of the Titans, and wielder of the Sickle with which he castrated and defeated his father Ouranos. Only in the Renaissance were these two deities linked more often, so that in present day these two are often confused. The Roman correspondent of Cronos is Saturn, and of Chronos is Chronus. Thank you Bram for for getting in touch and for pointing that out!